This is a super exciting recipe conversion and I want to thank Mindy, a traditionalcookingschool.com reader and sweet friend! She worked with my whole wheat tortilla recipe and converted it to be a soaked whole wheat tortilla recipe. She shared what she did in the comments of that recipe. I'll repeat her comment here, and then you can click through to the actual recipe. I did it! I just removed a tablespoon of water per cup and replaced it with 1 T. raw apple cider vinegar. (I actually halved the recipe this time around.) It worked beautifully. The tortillas tasted just the same! Probably I *did* let it soak a little long – there were a few spots that dried out a little. But they worked back into the dough easily. I actually soaked for a little over what NT recommends – I just didn’t get back to it as soon as I’d have liked. I think optimum would be 12-24 hours. And maybe next time I’ll experiment with letting the dough soak all together in a bowl, and shape it into balls as I make the tortillas. Thanks for providing such a great recipe, Wardee! My family loves it. The full recipe is here. The tortillas have always been good. In fact, the recipe could be one of the most popular recipes here. But since realizing that we should be sprouting and/or soaking all grains, I have wanted to provide a tortilla recipe that is 100% healthy. 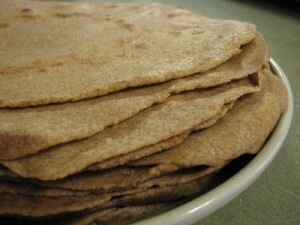 My solution – for our family – has been to make sprouted flour tortillas. But that's not possible for everyone, because it requires sprouting, dehydrating and grinding equipment. But now thanks to Mindy, we can offer a soaked tortilla dough recipe. If you try the recipe, be sure to comment and let us know what you think. I made your tortillas for dinner tonight and everyone LOVED them! Thanks for sharing the recipe. .-= Sustainable Eats´s last blog post… Moral Options for Can’t Live Without Items =-. Sustainable Eats – I am happy to hear that. I’m ready to make some this weekend – I’d like to know if soaking them will allow A. to eat them. (She’s sensitive to gluten, but sprouting works for her.) How did you do it? Mix up the entire dough and let soak, then finish up the recipe? Or did you only soak some of the ingredients? Oh good! Now there’s another method I can try when I’m in between spelt sproutings! .-= Sonya Hemmings´s last blog post… Grain of Salt (or Something) =-. I might give this a try. Right now I just grind the wheat. Do the tortillas taste different? I’ve been wanting to convert a gluten-free brown rice tortilla recipe that I make to be a soaked brown rice version. I haven’t tried it yet but will let you know, and maybe do a post about it, when I do. I would also like to use quinoa flour in the mix… we’ll see what happens. I’ve been making soaked tortillas for a while now and my recipe is very similar. I use 4c. fresh ground flour, salt, 1-1.25c. water, 2T yogurt, and 2T of a fat (like butter, coconut oil, bacon grease…) I knead that until moist but not too sticky and let sit overnight or so. The next day I roll them out and cook them on the skillet! This recipe makes about 15 or so 8″ tortillas. We eat lots of them, so I make them quite a bit… at least once a week! You can use this recipe with regular flour too, just add the water until you get a nice-not-too-wet consistancy. .-= Kimi @ The Nourishing Gourmet´s last blog post… And the Winners are…… =-. I made these yesterday and they are delicious! I made the entire recipe, with whey leftover from yogurt I had made the day before and some ACV (totalling about 1/4 cup) mixed with water to make a total of 2 cups liquid. I left it in my stand mixer bowl covered overnight. While making them, it wasn’t too long before I had a system down. It took me about 1.5 hours from start to finish yesterday. Completely worth it to me to know what’s in my tortilla! Thank you so much for the recipe conversion! I am trying to convert this to a gluten free tortilla. Anyone with experience soaking the xantham gum and sweetner with the flour? would there be any reason that you would not want to soak them?? ?